Thick; etched in faint relief with a few maple leaves on each face; brass rim in the three parts, i.e. two broad flanges and the actual almost flat outer rim; the latter is lightly punched with a wavy pattern of circles and dots; the convex flanges, each pierced with a zigzag row of holes and further lightly punched with circles, are inwardly cusped with four trifolate projections alternately with four smaller semicircular ones, and these cusps are similarly punched with circles of various sizes, some concentrically. Behrens Collection, no.1081. This minute description applies almost eactly to (1) a guard of the same size, formerly in the Hawkshaw Collection (no.45, pl.IV) and later in that of H. L. Joly, showing bamboos instead of maple leaves, and (2) one formerly in the Poncetton Collection (Cat. no.226, pl.XIV), of diam. 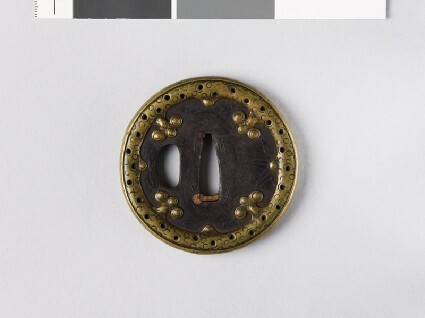 2.95", with the iron plain and the flanges uncusped. This latter M. Poncetton attributed to the Jingo School of Higo (Group XIII) and described the flanges as recalling the tentacles of cuttlefish.